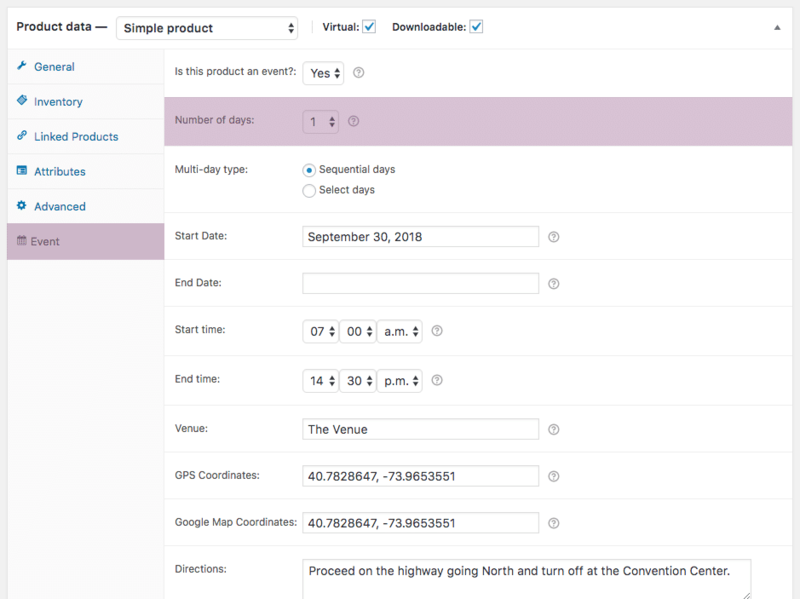 The FooEvents Multi-day plugin makes it possible to sell tickets that will give your attendees access to the event over multiple calendar or sequential days. What makes this feature unique is that the reoccurring days are not limited to weekly, monthly, or annual occurrences, but rather it gives you the ability to choose the exact days that the event will repeat ensuring that you have granular control. 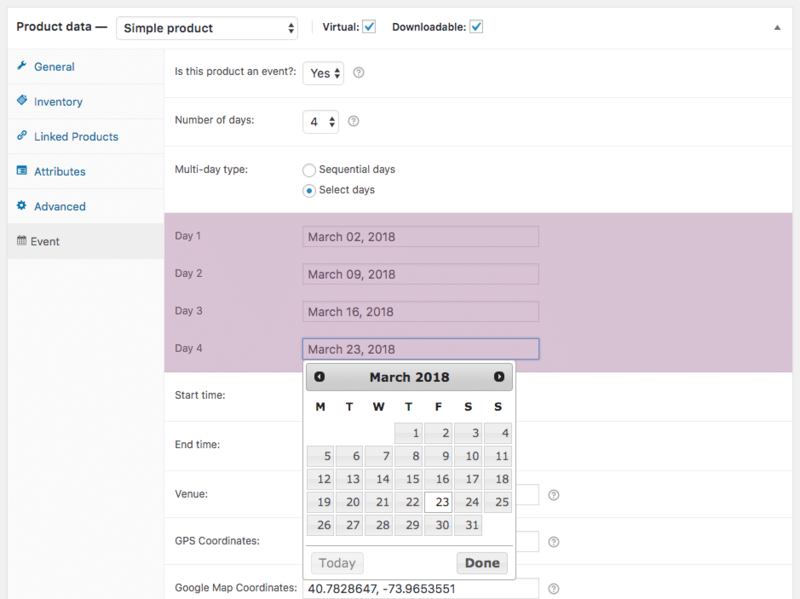 You will need an active FooEvents for WooCommerce license and an up-to-date copy of the FooEvents Multi-Day plugin installed on your WordPress/WooCommerce website. Next, you will need to create an event. If you need help doing so please be sure to visit our help guide. 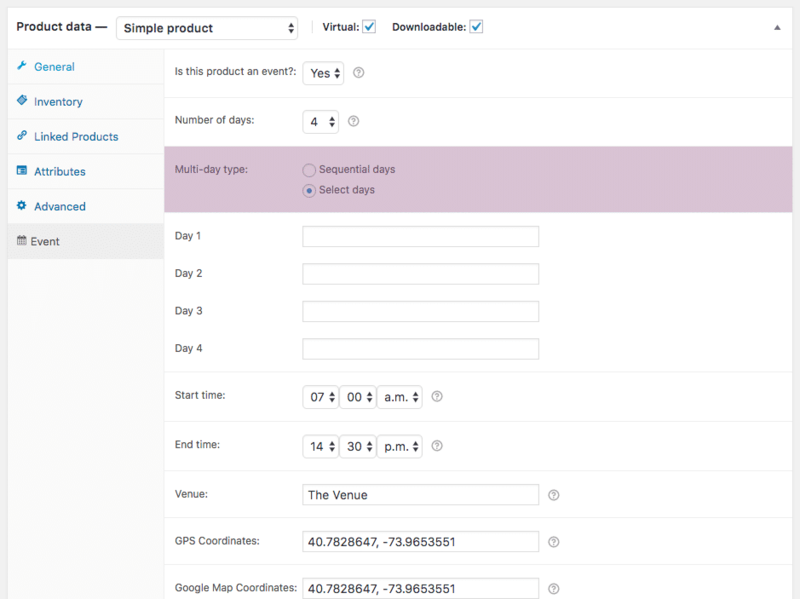 Open your event in the WordPress Admin Area and select the ‘Event’ tab under the product settings. Our example event is going to take place every Friday night for 4 weeks in March 2018. Choose ‘4’ from the ‘Number of days’ dropdown menu. Next, select the ‘Select Days’ option for the ‘Multi-day type’ field. This will make it possible to specify exact calendar days. The ‘Sequential days’ would simply add the set number of days starting at the event start date. Lastly, complete the remaining event information fields as required and publish the event. Your event will now repeat on the specified days. Attendees can purchase a single ticket that will give them access to each day. The FooEvents Check-ins App for iOS and Android and the FooEvents Express Check-in plugin will offer separate check-in options for each day making it easy to manage attendee access for the event. The FooEvents Calendar plugin will also display each day of the event as illustrated below.